One of the biggest acts in Japan happen to have a DJ dressed as a clown, but they're also gaining steam in the rest of the world. 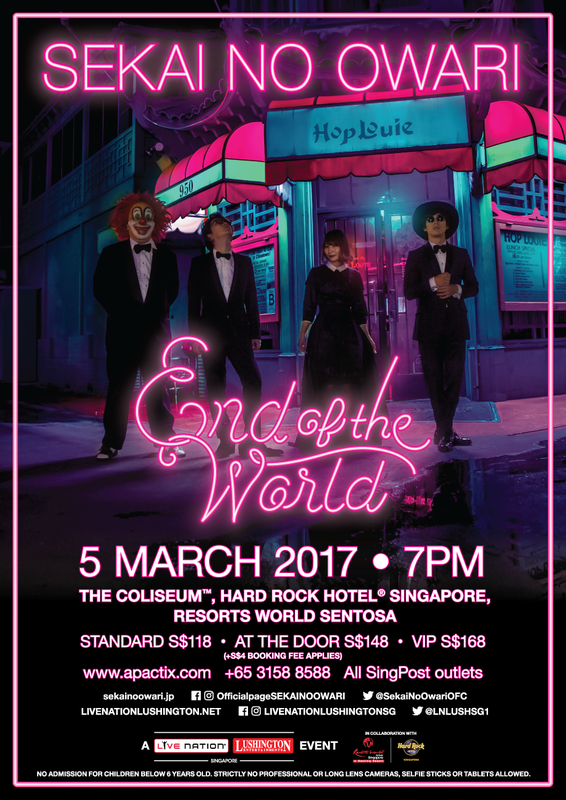 Pop band Sekai no Owari will make their live concert debut in Singapore, performing at The Coliseum, Hard Rock Hotel Singapore on March 5th. The band initially started out as an alternative rock outfit, but have since embraced stronger pop elements, fusing in synth-pop and EDM and performing songs with English lyrics. Since then, their concerts have grown to be a huge attraction in their native Japan, especially with their songs used as theme songs for the live-action adaptations of anime Attack On Titan, but they're also currently building their fanbases around the world. The four-piece are now working on their first fully English-language album, collaborating with EDM producer Nicky Romero and pop band Clean Bandit on songs that'll hit later this year. For now, fans might get a preview of their new songs at The Coliseum. Tickets are priced at SG$118 and VIP packages are available at SG$168 through Apactix from January 20th, 10am. Citibank card customers will be able to purchase pre-sale tickets beginning 18 January, 10am until 19 January, 11.59pm. Here's what we thought about Sekai no Owari when we caught them in Malaysia alongside Jason Derulo and Carly Rae Jepsen.